NSK Ltd. (NSK; Headquarters: Tokyo, Japan; President and CEO: Norio Otsuka) announced today that it concluded an agreement on February 2, 2013 to establish a capital tie-up in the bearings business with Ningbo MOS Group Corporation Limited (Headquarters: Zhuangshi Zhenhai District, Ningbo City, Zhejiang Province, China; President: Li Gang; hereafter, “MOS”), a leading private bearing manufacturer in China. Through this agreement, NSK will acquire a 25% stake in MOS. Details are as follows. 1. Reasons for the capital tie-up. NSK commenced manufacturing of bearings in China in 1995 with the establishment of Kunshan NSK Co., Ltd., located in greater Shanghai. 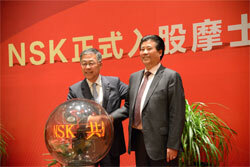 Since then, NSK has expanded its business in China in line with the country’s economic growth, setting up 12 factories. NSK currently manufactures and sells industrial machinery bearings, automotive bearings, automotive components, as well as precision machinery and parts in China. In recent years, the high-performance bearing market, which is dominated by Japanese, U.S. and European bearing manufacturers, as well as the so-called high-volume market in China have been growing rapidly. In this context, NSK acquired a 10% stake in Gongzhuling Bearing Co., Ltd. (Headquarters: Gongzhuling City, Jilin Province, China; President: Li Gang; hereafter, “Gongzhuling Bearing”), an automotive bearing manufacturer in the MOS Group. Both NSK and Gongzhuling Bearing have been promoting their business partnership to manufacture products for the Chinese market. On this basis, NSK has recently decided to further expand and strengthen its business alliance with MOS, which is a highly competitive manufacturer of small-size bearings and other products. 2. Objectives of the capital tie-up. By strengthening its business alliance with the MOS Group, a leading private conglomerate based in China, NSK intends to pursue the manufacturing operations required to make a full-scale entry and expansion into the high-volume market in China, as well as to build on its know-how in relation to the market while developing a network of suppliers. 3. Summary of the capital tie-up. After concluding the capital tie-up agreement, NSK will acquire 25% of MOS’s outstanding shares (valued at about 1 billion yen), and form a capital tie-up in the bearing business, encompassing manufacturing and sales. The capital tie-up is expected to improve the competitiveness of both companies, especially over the medium and long term. Its impact on NSK’s financial results in the current fiscal year is expected to be insignificant. Comment from NSK President and CEO Norio Otsuka. Comment from MOS President Li Gang. Established in 1916, NSK produced the first ball bearings made in Japan. Over its history, NSK has developed a wide range of bearings and supplied them around the world, making significant contributions to the development of industry and advancements in machinery. At present, NSK holds the top market share in Japan and the third largest share in the world for bearings. By applying its high precision processing technologies refined over many years of manufacturing bearings, NSK began diversifying into automotive products and precision machinery and parts at an early stage. The NSK Group has been aggressively expanding beyond Japan since the 1960s, and currently operates 63 production sites in 12 countries. With roots in China stretching back over 40 years, when it began providing technologies to the country’s state-owned industries, NSK now has 12 production sites and 19 sales branches in China. As it seeks to maximize the number of its technological centers outside Japan, NSK is establishing a business network in China that can operate independently and continue contributing to the development of diverse industries throughout the country, including automobiles and industrial machinery. NSK presently holds the top market share for bearings in China, and is aiming to double the current level of its sales in China to 200 billion yen by 2016, when it will celebrate its 100th anniversary. The MOS Group is a privately operated bearing manufacturer based in Ningbo City, Zhejiang Province, China. With seven factories across the country, it holds the top market share in China for small-size bearings made for office automation (OA) equipment. The MOS Group is widely recognized globally, as it exports large amounts of bearings to the United States, Europe, and many other countries. In recent years, the MOS Group has been undertaking mergers and acquisitions to aggressively enter markets for large-size bearings used for automobiles, machine tools, wind power generation facilities and other industries, thereby establishing itself as a top corporate group in China’s bearing market. In September 2012, NSK acquired a 10% stake in Gongzhuling Bearing Co., Ltd., an automotive bearings manufacturer in the MOS Group. © 2016 BEARING NEWS All rights reserved.